Skill Cards are cards with dark blue-colored borders that can alter the state of the game. These cards are introduced on Speed Duel format, debuting on Speed Duel Starter Decks: Destiny Masters and Speed Duel Starter Decks: Duelists of Tomorrow. These cards are only legal on Speed Duel format, and cannot be used on other formats. 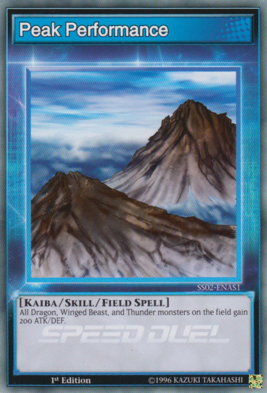 Skill Cards are not placed in the Main Deck, and currently there is no specified zone on the field where Skill Cards can be placed. Another distinction of Skill Cards from other cards is that the card backing is different from the standard card backing, featuring the character possessing that Skill instead. 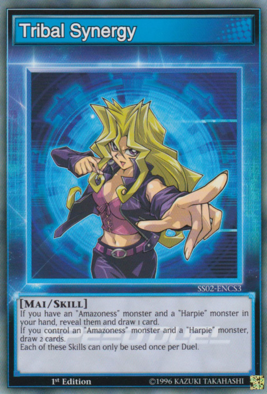 Some of the Skill Cards were adapted from Yu-Gi-Oh! Duel Links Skill mechanic. Each player can only have 1 Skill Card during a Duel. Before the start of the Duel, each player places their Skill Card face-down in front of them, where both players can see the character but not the actual Skill being used. However, some Skill Cards have specific instructions on where to place that card that is written on its back side. Skill Card effects do not use the Chain when activating and cannot be responded to. 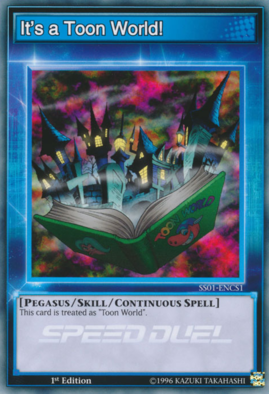 Once the activation requirements of the Skill Card are met and there are no cards resolving on the Chain, the player can announce the activation of the Skill, flip the card over and resolve it. yugioh-card.com STANDARD RULES FOR SPEED DUELING! This page was last edited on 1 March 2019, at 10:18.